We are pleased to welcome Saga from Spellbound and @spellboundsaga to the Twisted Nether Blogcast tonight. If you have any questions please make sure to send them in prior to showtime to info@twistednether.net or bring them to the chatroom! When is it? : This live show is scheduled for Sunday, September 1th at 8pm PT (11pm ET). Not sure what time that is for you? Use this handy-dandy time converter! This site is primarily a location for finding census data for all the World of Warcraft realms, but there are a couple of other interesting things you can do here. First, lets cover the obvious. 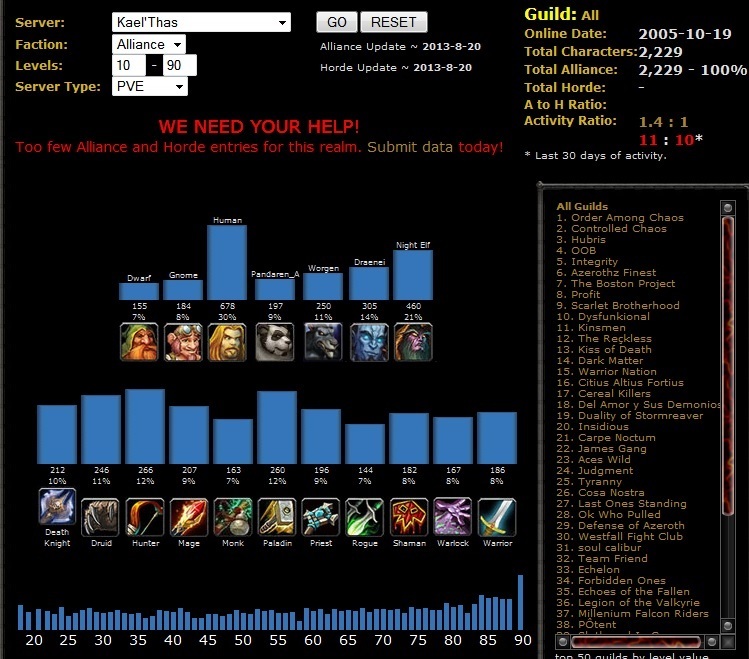 Warcraft census data is information about your server population. Are you mostly Horde or Alliance? Are there more pallys or shaman on your server? What level are they? What race? If you have these types of burning questions then this is the place for you! This census data is collected from stalwart heroes like yourself who download the addon CensusPlus, which can be found at Curse.com. You can use this addon realm census data while ingame as well as use it to collect census data and upload it back to the site for others to use. This site also provides a couple of other interesting things. Feel like you are surrounded by the enemy? See if your server is primarily one faction or the other.If you are looking for the ratio of horde to alliance players based on the number of characters — go to either the US Realm or EU Realm drop down. The list is provided in alpha order. Poke around the Graphs and you can find all types of interesting random information. Such as the past years average weekly activity by class. Interested in making a signature featuring your character to use in your guild forums and on the web? Go to the signature maker. Follow the instructions. You can pick all the colors and select a background and voila! A unique signature you can use all over the place. Now I’d like to tell you my favorite thing to do with this site. As a guild leader I’m never sure quite what I’m getting when people apply to the guild. If you are interested in getting some background info try this out. From the Realm Data drop down select Char History (character history). Put in a character name and server and you can get a full history of every guild they have been in. Until next time friends…go make the world a better place! We are pleased to welcome Zoopercat from Ask Mr. Robot back to the Twisted Nether Blogcast to talk about Patch 5.4 and all their great features to help us. If you have any questions please make sure to send them in prior to showtime to info@twistednether.net or bring them to the chatroom! When is it? : This live show is scheduled for Sunday, August 18th at 8pm PT (11pm ET). Not sure what time that is for you? Use this handy-dandy time converter!